Some skeptics having cast doubt upon Toby's acquaintance with the literary greats of his era, your editor has thought it prudent to give a brief account of several of them, and put forth the plain evidence of their connexions. I thought it best to, as it were, start with the top, which without question is occupied by that splendid brainbox, Dr. Johnson. Johnson had that particular alloy of irritability and genius which, though often imitated, remains extraordinarily rare. He began life as a poor man, so poor indeed that during his brief time as a student at Pembroke College, Oxford, he could not afford new shoes to replace the tattered and nearly useless ones he possessed. A kindly fellow, aware of this difficulty, quietly left a new pair by Johnson's door, but he refused to wear them. When his money ran out entirely, he left Pembroke rather than accept the charity of others. The rest of his storied life would scarce fit in these pages, but his success as a periodical writer, and his great work, the Dictionary, are too well-known to require rehearsal. But what sort of man was Johnson? He was brusque, opinionated, and so rude on occasion that some latter-day diagnosticians believe he suffered from Tourette's Syndrome. He did not so much speak as blurt, and many of his exclamations have joined the list of immortal quotes: "Patriotism is the last refuge of a Scoundrel," "No man but a blockhead ever wrote, except for money," and "When a man is tired of London, he is tired of Life," to name but a few. By the time he met Toby, he was in the last year of his life, and knew it; his visit to his old College was part of a final tour of familiar locations, which ended a few months later in London with his death. Dr. Johnson's remarks about Toby are well-known, as they are quoted in Boswell's Life, and Toby's own narrative agrees with them almost verbatim, although they are part of a much more extended conversation. "Pig has not been wanting to Man, but Man to Pig" -- such might serve as an epigram for Toby's entire life story. Johnson's connection with Anna Seward -- a "jousting partner of the pen," is also warmly recalled by Toby, as it was by Boswell, although after Johnson's death many of Miss Seward's recollections were rejected by Boswell as uncharitable. 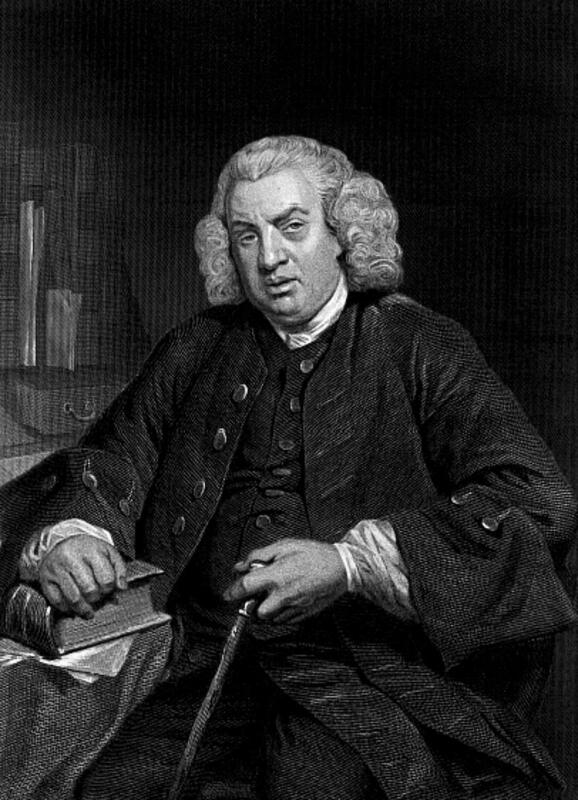 As the reader may have inferred from my introduction, my own picture of Johnson has been, for better or worse, indelibly stamped by Robbie Coltrane's portrayal of him in the Blackadder episode, "Ink and Incapability." The good Doctor's reaction as Blackadder peppers him with portmanteau words -- "interphastrically," "pericombobulations," and "extramuralisation" -- is priceless. And yet it may surprise many to learn that Johnson's own accent was anything but the posh pretentiousness of Coltrane's memorable performance; he had, in fact, a very thick and distinctive Staffordshire accent; according to Jeffrey Meyers' Samuel Johnson: The Struggle, he said "shuperior" for superior, "woonse" for once, and "poonsh" for "punch." I hadn't realized this myself, until on listening to the audiobook version of PYG, I heard Simon Callow's marvellous personation of Johnson's voice, which perfectly and richly evokes both the accent and the man. I was told later that it was at Dr Johnson’s personal insistence that we were brought, and given seats quite near his, seats that many of the Fellows had coveted, as they jostled against one another to gain Proximity to their learned Guest … For that one day at least, I felt that I had accomplished something so very Notable that it distinguished me for ever among all the Animals who have had the benefit of Lessons: I had been invited to dinner by Dr Johnson.